In this film, 'Her' refers to both Paris, the character of Juliette Janson and the actress playing her, Marina Vlady. The film is a kind of dramatised documentary, illustrating and exaggerating the emotionless lives of characters in the new Paris of the 60s, where commercialism mocks families getting by on small incomes, where prostitution is a moneyspinning option, and where people are coldly resigned and immune to the human nightmares of Vietnam, and impending Atomic war. The least successful Godard film I've seen, and I've seen more than a dozen others, 11 March 2002 Author: zetes from Saint Paul, MN Although it was a critical success when it was released, and it still has strong supporters today, I personally found Two or Three Things I Know About Her a very weak film. It represents a day in the life of a prostitute/housewife, though that itself is difficult to tell. The film is rather amorphous. Maybe that's a word that many would use to describe the whole of Godard's films. But almost all of his other films, with the possible exception of Alphaville and Contempt (both of which I need to see again, having not seen them for a few years), have a little more internal structure and, what is especially missing from Two or Three Things, a pace. 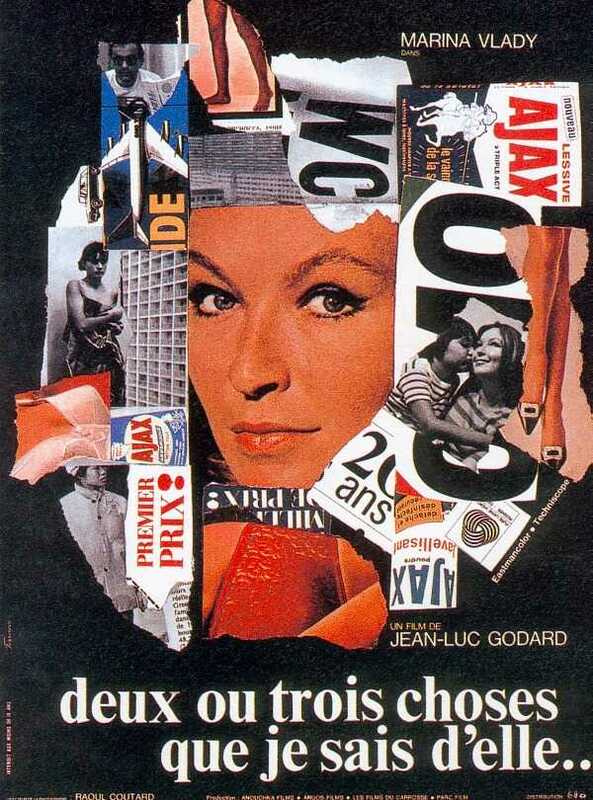 Other films of his are also more biting in their satire or drama, depending on what Godard is going for. Two or Three Things is dead in the water. Think of the giddy quickness and insanity of Pierrot le fou or Le Week-End, or the frightening images of Le petit soldat or Vivre sa vie. This film is not worthless, however. I've never seen a Godard film that I would call bad. And it is, like all of his films (I also haven't seen one that any fan should miss), important in his development as a director. You can see Le Week-End about to burst out of the screen. Two or Three Things contains a couple of remarkable scenes, including the coffee scene. Godard narrates in a whisper, philosophizing over his own role in the universe, as creme swirls in a cup of coffee and clusters of bubbles rotate and pop (the camera is so close that you can't see anything but the coffee in the cup). The cinematography in general, by Godard's frequent collaborator Raoul Coutard, is quite good. I especially like the shots of construction equipment, cranes and such. They're kind of like the opposite of Yasujiro Ozu's pillow shots. 6/10.